Modern: 1. Of, or relating to the present or recent times as opposed to the remote past. 2. Characterized by or using the most up-to-date techniques, ideas or equipment. Synonyms: Contemporary, current, fashionable, stylish. Traditional: Existing in or as part of a tradition; long-established. Synonyms: time-honored, classic, accustomed, standard, normal, conventional, usual. How can we make anything in 2014 that isn't modern, by virtue of it's creation date if nothing else? 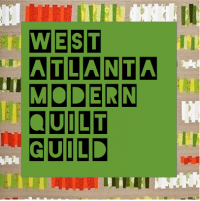 But then as a quilter, I feel acutely aware of standing in the line of this group of makers that stretches back and back and back. I love being part of the tradition of quilters and makers, just as the women before me were and hopefully my daughter will be. I know that there isn't really truly anything new under the sun, but I can put my own fingerprint on it and call it new to me. There are many ways to change something just ever so slightly and make it feel refreshed and current and that, to me, the definition of "modern traditional". I have been in love with the whole range of Sketch fabrics since I first saw them, especially the tone-on-tone colors seem like the perfect blenders. 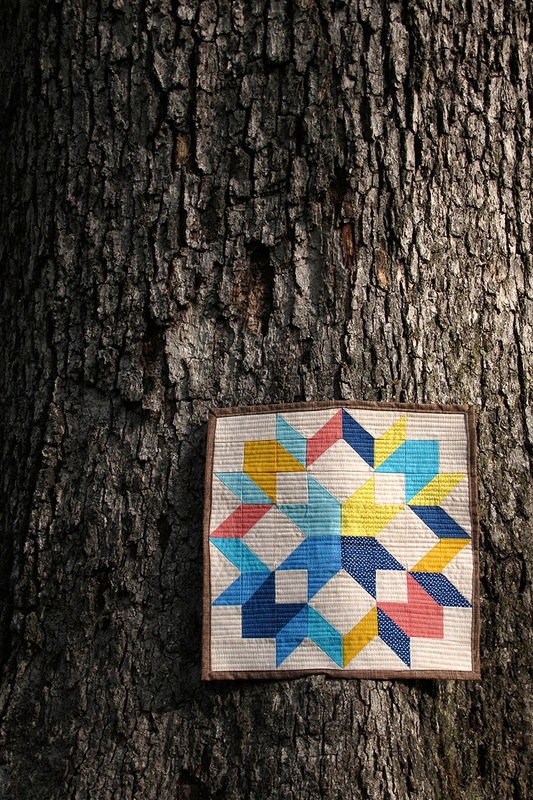 I love them and I use them anyway, so I was particularly excited about the Dear Stella/Timeless Treasures mini quilt challenge. I already had a good selection of Sketch to play with and the addition of a few Confetti Dots from Dear Stella helped fill in my beach color story for this project. 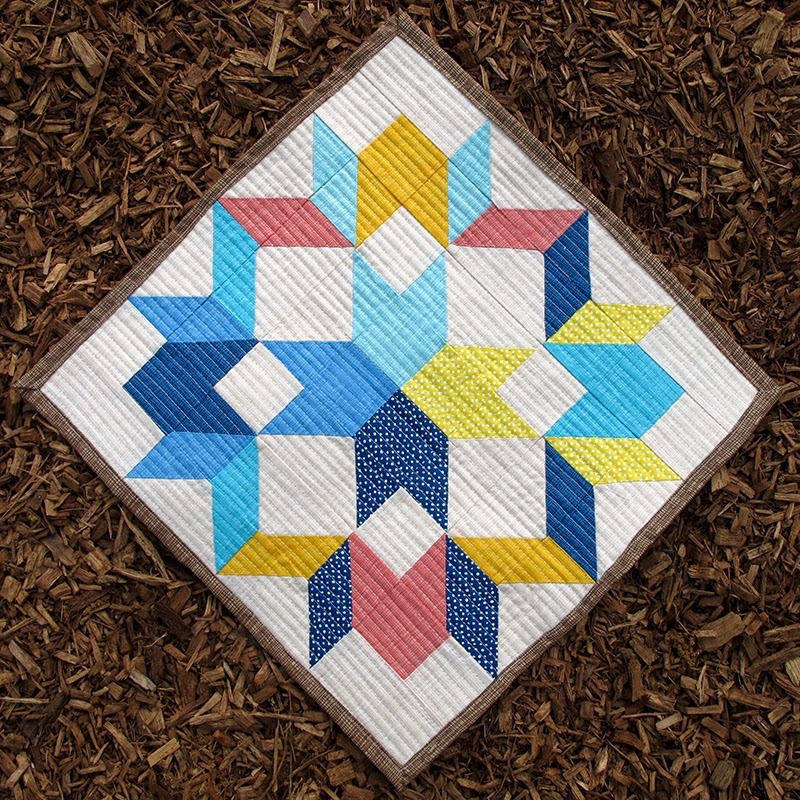 This pattern is the Swift Wreath Pattern from Caroline Greco of Nightingale Quilts. 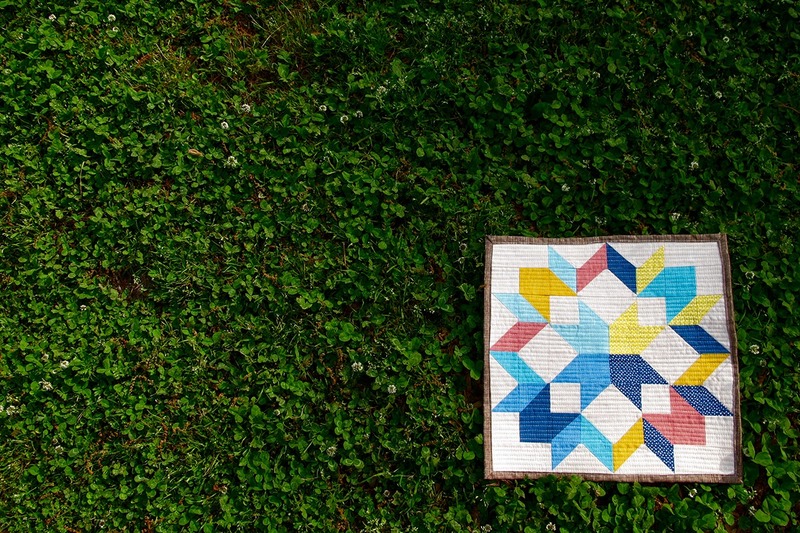 The original pattern makes a 32"x32" quilt so I had the brilliant idea to just halve all the measurements and make a 16"x16" mini which would be perfect for the 20" or smaller requirement. Do you know how fussy 2" HST's are? Quite fussy actually. I ended up with a 14" square quilt which had me absolutely baffled until a good friend pointed out that I probably didn't halve the seam allowance too. Uh...no. Still used the plain old 1/4" seam allowance but should have used 1/8". Insert hand smacking forehead here. But at least I'll know for next time. So I persevered through the fiddly parts and I am very happy with how this mini turned out. The light tan sketch was perfect for the "sandy" background color and the blues, golds and peach remind me so much of a sunset walk on the beach. Sigh. Sadly we have no beach anywhere near for a photo but my sweet husband helped me get some great shots at a local park. 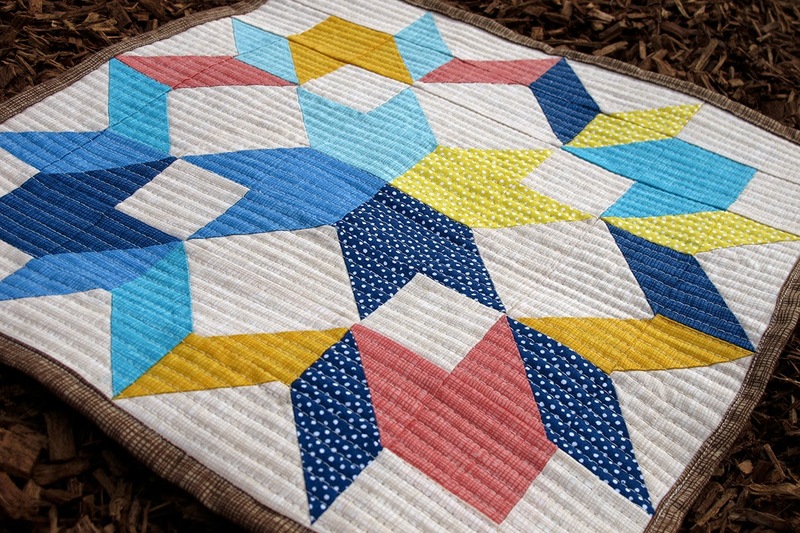 I love how the straight line quilting added a whole new dimension to this little guy. 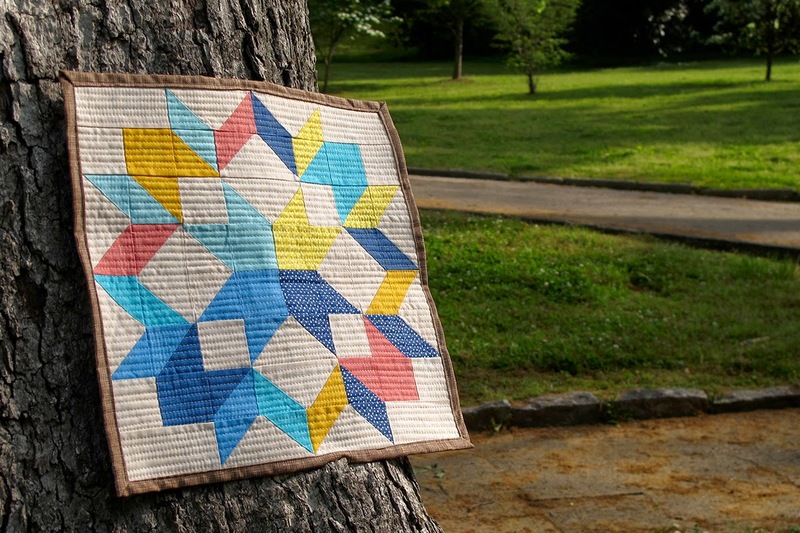 So here's my entry for the DS/TT "Modern Traditional" Mini Quilt Challenge. I couldn't love it anymore. You can find the pattern in Caroline's Craftsy shop. 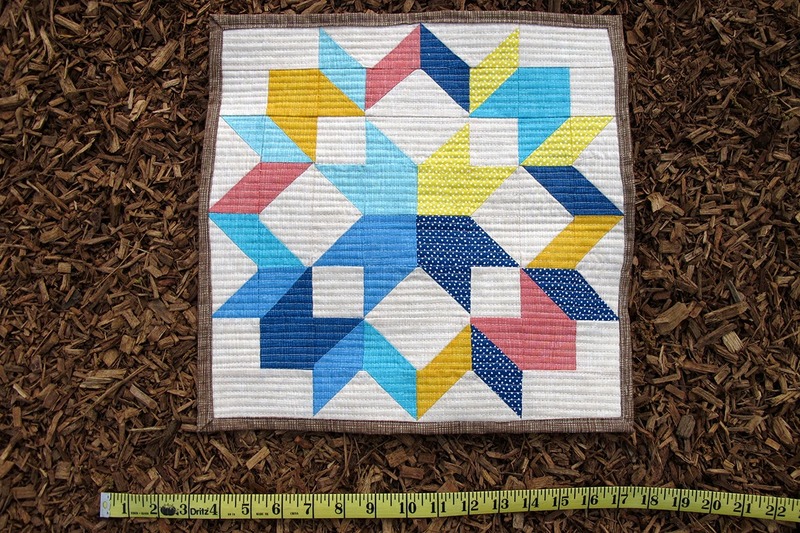 Thanks to Dear Stella and Timeless Treasures for hosting such a fun challenge.